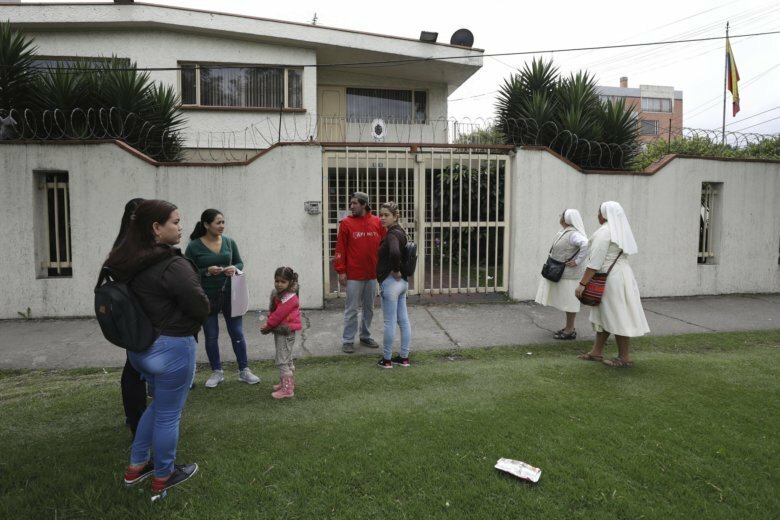 BOGOTA, Colombia (AP) — When Lorena Delgado approached the Venezuelan consulate in Colombia’s capital on a recent afternoon hoping to extend the life of her expiring passport, she found the metal gates to the languishing building shuttered. The man challenging Maduro’s claim to the presidency had appointed a new ambassador, but he was at a loss about how to help her. Despite Colombia recognizing Juan Guaido as Venezuela’s legitimate president, the ambassador he sent does not have access to the consulate or the ability to issue passport extensions. As Venezuela’s power struggle stretches on, a parallel dispute for control of embassy buildings in the countries recognizing Guaido as Venezuela’s true president has taken root. While new opposition-appointed diplomats are being recognized around the world, the United States is the only nation where they control a consulate building. In no country do Guaido’s envoys have the ability to carry out basic tasks like issuing a passport, as Venezuela’s civil registration agency remains under the control of Maduro. The diplomatic duel has left the estimated 3.4 million Venezuelans who now live abroad stuck between two administrations. In most countries holdover consular employees continue to carry out tasks like registering births abroad while new, Guaido-appointed ambassadors remain outside embassy walls, symbols of their movement’s lagging advance. “At this moment, we don’t have a solution from either side,” said Paola Soto, 25, who is trying to reunite with her 5-year-old son in Chile. Costa Rica’s Ministry of Foreign Affairs, despite recognizing Faria as Venezuela’s ambassador, issued a statement deploring her actions, saying she’d broken an established protocol allowing Maduro appointees 60 days to leave. “You’ve robbed enough in Venezuela!” one angry woman shouted. More recently, on Monday, Guaido’s U.S. ambassador announced he was taking control of the New York consulate and two military-owned buildings in Washington where images of Maduro have now been replaced with portraits of Guaido. He warned that if the U.S. doesn’t fulfill its international obligations, the Venezuelan government could pursue legal action and retaliate with reciprocal action – a not so veiled threat that they might occupy the recently vacated U.S. Embassy in Caracas. The U.S. withdrew all embassy personnel from Caracas due to safety concerns after Maduro severed ties with the U.S. over its support for Guaido. Gustavo Marcano, an exiled Venezuelan mayor who now works for the Guaido-backed Venezuelan embassy in the U.S., said the building acquisition is one of several attempts to ensure Venezuela’s assets abroad are protected. The U.S. is also working to transfer other prized belongings, like Houston-based CITGO, a subsidiary of Venezuela’s state oil company, to Guaido. “This is the first step toward ending usurpation,” he said from inside the Manhattan consulate, where photos of the late socialist leader Hugo Chavez still hung on the walls. In other countries, the Guaido-named ambassadors are taking a gentler approach, choosing to slowly work toward eventually taking control of consulates in conjunction with the host nation’s foreign relations ministry – or avoiding the topic altogether. Humberto Calderon, the appointed ambassador to Colombia, said he’s focused more on tending to Venezuelan migrants, viewing occupying the buildings as a potential agitator that could harm Colombians living in Venezuela. Calderon once served as Venezuela’s energy minister and is working from a hotel. He said that when Maduro severed diplomatic relations with Colombia, nearly all the consular staff left, boarding a government-sent plane and flying home. He’s had no access to anything they left behind in the buildings. In Peru, five Maduro-appointed envoys will remain in place to carry out consular functions, according to a high-ranking Venezuelan official who spoke on condition of anonymity because he was not authorized to discuss the situation. He said that after talks with Peru’s foreign ministry, an agreement was reached allowing them to remain in the country and continue working in the embassy, even though the nation recognizes Guaido’s ambassador. That’s a scenario that’s likely to play out in most countries: Even as more than 50 heads of state declare their allegiance to Guaido, necessity will inevitably compel them to maintain a range of ties to the Maduro government. “Ultimately it’s not in any country’s real interest to maintain an embassy that’s run by staff that have no ability to advance commercial or consular interests,” said Geoff Ramsey, a Venezuela researcher at the Washington Office on Latin America. He pointed to the case of the Netherlands, which despite backing Guaido, has pledged to keep the Maduro consular staff intact in the Dutch Caribbean island of Curacao, which stands about 40 miles from Venezuela’s coast. The Netherlands has joint ventures with Venezuela’s giant state-run oil company at stake. “It’s very much a dual diplomacy situation for many of these countries,” Ramsey said. Soto said she doesn’t know how to explain the standoff to her son, who left by plane from Venezuela with his father over a year ago. Ever since she’s been trying to meet up with him in Chile but has gotten stuck in Colombia.